This well appointed two-bedroom, two bathroom condo is located in the Coronado Condominiums in beautiful Lakewood, where you’ll enjoy easy access to a growing number of shops, restaurants and amenities right in your area. Not to mention miles of natural grass land trails in and amongst the wet lands. Great for evening walks. Full elevator service will get you from your underground parking stall to your unit in a snap. This home offers an open main living area with a lovely maple kitchen that includes a built-in dishwasher and microwave, a fridge and a range. Granite countertops give it a high-end touch. A generous breakfast bar nicely expands your counter space making this room a joy to prepare a meal in. The spacious living room has a garden door to a private balcony where you can connect your barbecue to a natural gas supply so you never run out of fuel. The dining room is huge and flanked by large South West exposure windows making it a bright and inviting space for all your family gatherings. The master bedroom boasts a bathroom with a full size shower and a double mirrored closets. The home also has a laundry/storage room with a washer and dryer. Water heat provides great warmth through the winter and central air will keep you cool through the hot Saskatchewan summer months. 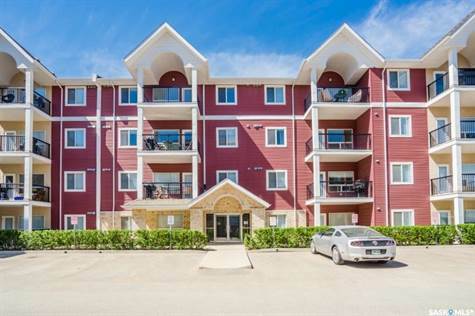 Additionally you have your own stall and storage in the heated underground parking garage. There is also additional underground and surface parking available should you require more. Building amenities include a fitness centre, guest rooms to house visiting friends and family, and a common room with kitchen that can be booked when you want to entertain large groups. This is such a great unit. Don't delay...Call today!